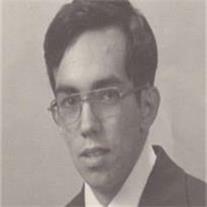 Daniel Irizarry Obregón Pagán, 53, passed away August 29, 2010 in Mesa, Arizona. He was born July 27, 1957 in Mesa, Arizona. He was preceded in death by his father Daniel Garcia Pagán, his brother Ricardo Obregón Pagán and his nieces Tara Colleen Margarita Pagán and Rosa Cristina Liljenquist Pagán. He is survived by his wife Darlene Chapman Pagán; children Amanda Pagán (Brad), Shelledy, Katrina, and Jonathan Pagán; mother Margarita Pagán; brother Eduardo Obregon Pagán; sister Cynthia Malolo (Brent); and uncle Clint Warner. Funeral Services will be Friday, September 3, 2010 at 10 AM preceded by a visitation at 9 AM. Interment will follow at East Resthaven Cemetery, 4310 E. Southern Ave. in Phoenix. Arrangements by Bunker’s Garden Chapel.